Proper nutrition for athletes is vital, whether you’re jogging or running harder. Learn how to fuel the body correctly for different exercise intensities. In this week’s episode we interview Tom Bainbridge. Tom is co-host on the fantastic Ben Coomber Radio show which went from being a university student hobby to being the number one health and fitness podcast! Tom and Body Type Nutrition also teach a great nutrition course, so if you’d like to learn more from them be sure to check out their website for more info. How proper nutrition helped Tom become leaner, fitter and healthier. Overcoming the barriers to getting fit and eating properly – from pre-contemplation to action and maintenance. Self-education and how it can help you move beyond losing weight to performing well as an athlete. The importance of taking imperfect action. The different ways experienced and emerging athletes can view nutrition. 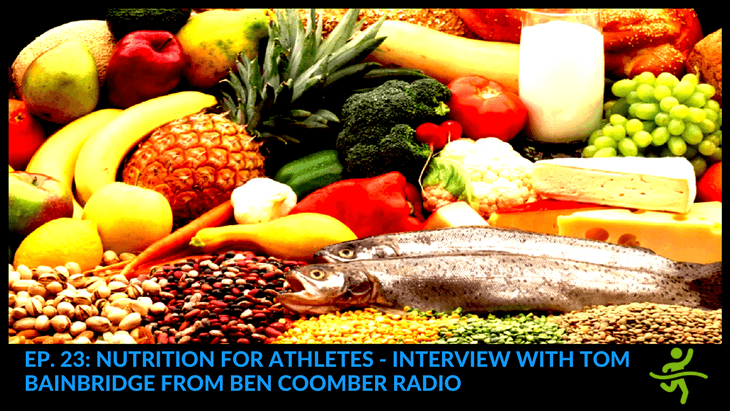 The story behind the Ben Coomer Radio podcast and the Ben Coomber Academy. Why the Q&A sessions on Ben Coomber Radio make essential listening. The molecule that text books refer to as the energy currency of the body. The three different types of muscle fibre and why they’re so important for athletes. Exercise intensity and its impact on the fuels we burn. Why endurance runners must eat enough to fuel their training. Keeping track of your calorie needs as an athlete. 1.37 What got you into nutrition? 3.41 What were the barriers? 5.30 Do people commonly get stuck at one stage or does it vary a lot individually? 8.58 What was the story behind the Ben Coomer Radio Podcast? 11.16 How much time do you find you’re spending on the podcast? 13.11 What are the different energy systems and how do they work in practice?